Change is something you can count on, sooner or later it’s going to happen. One day you’ll be looking at your website and think it’s the most beautiful site in the world, then as time passes, you realize that you’ve drifted away from your original goals and you need something fresh and new. This happened to our long-time clients Betsy and Peter Wuebker of Passing Thru. Several years ago we helped Betsy and Pete with a banner for their (then) new business, Passing Thru. They were embarking on a nomadic lifestyle, one that would make their business location independent, enabling them to travel, see the world and at the same time, maintain a steady flow of income. Well, that worked out pretty good for them. They ended up living a dream life in Hawaii, something many of us only wish could happen. Last month Betsy approached us and said her site needed some updating. She had a theme on WordPress, the same one she’d had since we met her. She tried making changes to the site, picking out custom fonts, trying to jazz up the sidebars and adding more images, but the fact of the matter was, the theme was severely outdated and it showed. 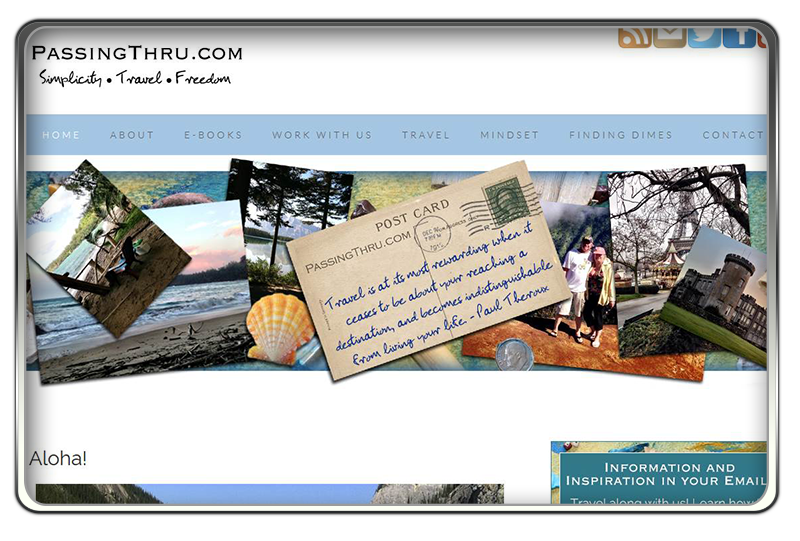 No matter what she did, she couldn’t get that open, bold, colorful look many of the other travel sites in her niche had. As you can see, the site was too boxy and the overall color scheme washed out and bland. Now, we know Betsy and Pete. We know that their personalities are much more vibrant than what this site was showing. They had so many gorgeous photos from their trips that weren’t being shown off at their very best. We all agreed it was time to let go of the past and embrace a bright new future. First, we scrapped everything. Since they already had WordPress installed, all we had to do was focus on a new theme. We had Betsy send us some of her favorite photos and picked our color pallet from there. Brilliant blues and tranquil turquoise became the primary colors, with little splashes of orange, yellow and tan. We installed the Genesis Framework and chose the Beautiful child theme. Betsy loved this child theme right away for it’s clean white space and overall airiness. The new theme didn’t need much customization. We would change the links, navigation and footer area to match the colors we chose, and the overall font on the site would stay the same. The biggest customization came with the banner image. For that we needed something extra special. Betsy wanted an eclectic, scrap-booky kind of look. Sure, we could have found a painted background on iStock, but to get the exact colors and feel of the new site, we needed to do something totally custom. I asked Wendi if she would do a painting we could use for the background behind the photos. This was absolutely perfect. Bright, colorful, full of texture and totally 100% unique. I then worked my Photoshop magic; cropping here and there, taking that dime in the lower right hand corner, masking it out and moving it to the left more, layering the photos on top, and taking a couple of the bamboo sticks and layer them on top on the right hand side of the final image. Now that we had the theme and new branding finished, it was time to take those elements and create Passing Thru’s social network backgrounds. This is one of the benefits of working with Blue Sun Studio—once we have your branding down and on file, it’s easy to create everything else you need from those initial elements. Even if you came back to us years later with a new project, you won’t have to explain yourself all over again, telling us who you are and what you do. We already have it, it’s all there. We loved this project and the way it all came together. It speaks of Passing Thru’s true essence as a brand, and carries with it Betsy and Pete’s vivacious personalities. Wendi’s contribution added so much to the finished product and reflects Blue Sun Studio’s own spirit of teamwork. We know that Passing Thru will have a site that will grow with them for more years to come—and when it’s time to update, we’ll get together and do it all again! Was this post helpful? Share it! And be sure to click on the links to follow Passing Thru and visit their live site for yourself. Do you have a site that needs a makeover? Call us! We’d love to help you like we did Betsy and Pete. Also sign up for our weekly ezine Around the Studio. I love this summary of how things came together! It is so fun to be involved in a creative process with people who get what you’re all about, perhaps even more than you yourself do. Our overall design history speaks to how consistently your strong intuition blends with interpretive work. Your guidance has been strong and on point. The result is a design that strengthens over time. You know not only who we are, but where we’re going. Thanks, Betsy! We can’t wait to find out what this next chapter brings for you. Next stop…FIJI!! I am an individual that does not like change. However in business I’ve learned it’s okay to change and revamp things as our business model and even as our business vision changes. I like that you all know your clients so well that you delivered for them exactly what they needed. That’s part of the process, Alicia. We really take the time to get to know each of our clients before we start any design work. Helping them create clear goals is what it’s all about. Wow, that’s amazing what you can do!!! Kinda neat to hear you put it down into the actual story line of how it happened. I’m impressed with the photo work you can do! It looks awesome! Fay recently posted..Want to change someone’s bullying or negative behavior? Try these 4 easy steps! …and along with taking the time to learn about your client, the other foundation key is everything comes down to story. Whether it’s a post, an about page, a single image or a website, if you’re clear on the story, the rest falls into place. Great point! I am in the process of this myself and having made a few color changes and adding some better links and captures, it’s not the new me. It’s cost effective for now, as we plan for the new site in the next year. I’m very visual so if it doesn’t feel like I do inside, I don’t want other to see it and it feels out of alignment. As I have shed my skin, so must my web site! !